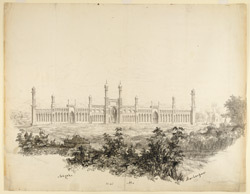 Pen-and-ink drawing by Philip Meadows Taylor (1808-1876) of the Idgah at Burhanpur in Madhya Pradesh, dated 1837. The image is inscribed on the front in ink: 'Eedgah-At-Boorhanpoor. M.T. 1837. No. 42'. An Idgah is an Iranian term for a prayer area open to the air. Also called Musallas or Namazgahs, they provide extra space for prayers said during festivals. Taylor wrote in 'The Story of my life', "ln 1837 we made a charming excursion to Burhanpur.... I took several sketches at Burhanpur, every street and turning abounding in subjects for the pencil, so that the difficulty was in knowing where to begin."